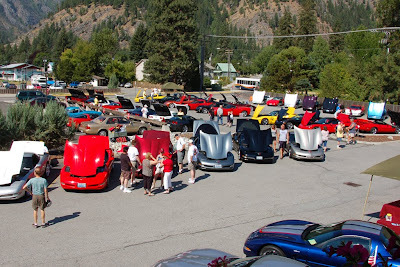 Back in July Grandma and Grandpa came up for the Corvette Show in Leavenworth. 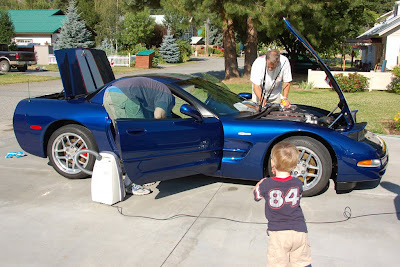 The guys getting it ready for the Show and Shine. I kid you not when I say the judges go over the car with white gloves. Grandpa won last year and got third this year... but we think one of the judges was overly harsh. Still pretty good considering he drives his car up from Oregon and other people bring theirs in on trailers to avoid any road dust. 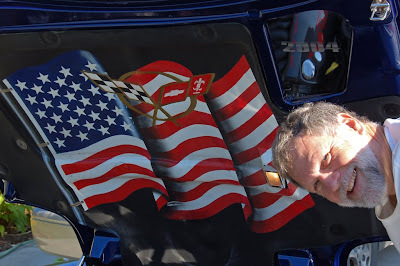 Yes, this picture is under the hood. How many of you could eat off the underside of your hood? Or your engine? It's that clean! Final polish in the hotel parking lot before "rags down" and judging begins. About 2/3 of the cars present show in this picture. A little photo shoot by the river. 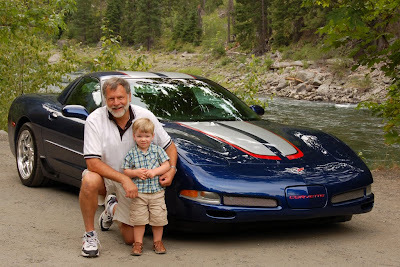 Grandpa, his car, and his only Grandson. Life is sweet! 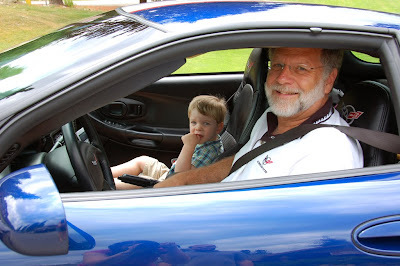 Cory thinks Grandpa's "blue Corvette" is the coolest thing ever... especially when he gets a ride! (don't freak out anyone, it was just on a private road around a golf course!) When they got back he cried because he didn't want to get out! Grandpa's and Cory's love each other! Why is it that only people of retirement age can afford cars like that?